Athletic Profile Height: 6' 3.75" Weight: 234 lbs. Forty: 4.9 sec. All-Round Athletic Ability: Football, Baseball, Soccer. Versatile: Has played Tight End and Defensive End. years of high school football (starter in 39 of 42 games). 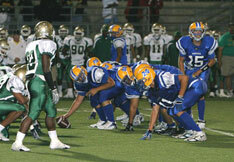 Long Snapping: Handles Punt, PAT and Field Goal snaps. very naturally gifted. . . a good head on his shoulders." 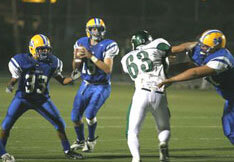 38-14 victory over the fifth-ranked Vista Panthers last night."